The T.27 electric city car achieved a stunning feat Saturday, winning multiple awards in the second running of the RAC Future Car Challenge. Most amazingly the car achieved an astonishing 347mpg equivalent. The T.27 took home three awards which included, ‘Most Energy Efficient Small Car (Prototype),' ‘Best Overall Pure Electric Vehicle,’ and ‘Best Overall Entry – RAC Future Car Challenge Winner’. The RAC Future Car Challenge is an extremely practical method for demonstrating and testing new green vehicle technologies, since the race takes place in real world traffic conditions and streets. This gives a truly easy to understand and accurate metric for how vehicles perform. Gordon Murray Design got funding from the UK government and several companies which included, Zytek Automotive Limited, Vocis and Michelin. The project cost roughly $14,500,000 dollars. There are 3 interested manufacturers for the T.27. One possible manufacturer is in the UK. The T.27 is the latest vehicle to use Gordon Murray Design’s innovative iStream manufacturing process. The iStream process aims to significantly reduce life-cycle impacts and enable low cost, efficient manufacture. The T.27 sets new standards in weight, footprint, small car dynamics, safety, packaging and efficiency while addressing a vehicles full lifecycle CO2 emissions, congestion, parking and low cost motoring. The iStream process is derived from Formula One race technology, delivering many benefits, such as being lightweight along with delivering a high degree of safety. The company completed a structural durability test which showed the T.27’s iStream chassis to be up to 60 times more durable than a regular steel vehicle structure. There are many other benefits as well. The simplified assembly process means that the vehicle plant could be roughly 20% smaller. This could reduce capital investment in the assembly plant by approximately 80%. The plants are also able to reduce greenhouse gas emissions, due to their efficiency and size. The production process allows for flexibility to produce a wide range of models, meaning many different cars can be made in the same plant. The iStream process won the prestigious ‘Idea of the Year’ award from Autocar in 2008. 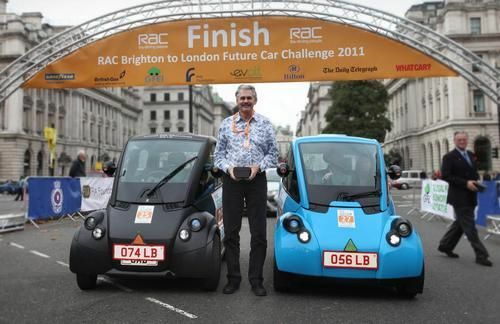 “This win represents a huge step forward in our race to reduce automotive energy consumption and emissions.” commented Professor Gordon Murray, CEO & Technical Director of Gordon Murray Design, referring to the 2011 RAC Future Car Challenge wins . Murray is used to a different kind of race though, since he is a legendary designer of Formula One cars. He also designed one of the most spectacular supercars ever made, the McLaren F1. Another one of his design achievements is the Mercedes-Benz SLR McLaren. “This year’s success in combination with last year’s win with our petrol powered T.25 ...proves absolutely that lightweight is our most powerful tool for solving our energy problems. Our team is proud to have worked with the Technology Strategy Board and our other partners on this exciting programme and we look forward to working with a manufacturing partner to make the T.27 with its low running costs available to the motoring public” Murray added.